God had the power to save Jesus from death. And while Jesus was on earth, he begged God with loud crying and tears to save him. He truly worshiped God, and God listened to his prayers. Jesus is God's own Son, but still he had to suffer before he could learn what it really means to obey God. Suffering made Jesus perfect, and now he can save forever all who obey him. A young husband and father, who was also a farmer, came into the house for lunch. There was a small disagreement with his wife over the lunch table – nothing too serious or too intense. He went out to the shed where he kept his tractor, threw a rope over the rafters, jumped off his tractor and ended his life. One of the children went out the shed after school and found her father. Questions were on everyone’s lips. Why did do it? Was it the argument over lunch? Was the marriage so intolerable? Was it the low prices he had received for his grain? Or was it the mounting debt to the bank – money that he needed to keep his farm going and to feed his family? Was it a sense of failure? Was there some kind of mental illness, maybe depression, that no one knew about? He loved his kids and seemingly his wife – what drove him to such an extreme action? Everyone was trying to get inside the mind of this young man and find out what it was that led to his death. Everyone was guessing but in the end no one ever really knew what was going on his head when he decided to end it all. At some time all of us have been perplexed and troubled by the behaviour of others and have found it difficult to fathom what is really going on in their lives. I guess that happens because all of us are different. No two people have the same experiences. Our genetic makeup, our upbringing, the culture we live in, our understanding of religion, the confidence that we have in our abilities, our friendships, the conflict we face, the differences in each of us to tolerate stress, worry and pain all end up making us all unique individuals. That’s why it is sometimes very hard to understand why people behave in certain ways. The young woman born into a wealthy family cannot fully understand what it’s like to live in a family where there is money only for essentials and no money to spare for new dresses, parties, concerts or even education. The person who has never taken a sick day in all his working life cannot fully comprehend what it’s like to be a person who has suffered one illness after another and there seems to be no end in sight. The gifted person with a high IQ cannot know what it is like to be person of much more limited intelligence. The parent whose little children cause no difficulties cannot fully know what it’s like to have a child who cries all day and then all night leaving the parents exhausted, frustrated, impatient and desperate, perhaps even to the brink of harming the child. Those who are brought up in a warm, loving family are not able to fully understand what it like for the person growing up in a dysfunctional, abusive family situation. The question that all this leads us to ask is – how much does Jesus understand what is happening in our lives? We acknowledge that he is God; that he was there at the creation of the world and is now ascended to heaven where rules with all power and authority. As Paul wrote, "Christ rules above all heavenly rulers, authorities, powers, and lords; he has a title superior to all titles of authority in this world and in the next. God put all things under Christ's feet and gave him to the church as supreme Lord over all things (Eph 2:21-22). If Jesus is so totally different to us, how well can he appreciate the things that are happening in our lives right now? Has he ever had a sick day? Has he ever had to grapple with depression, terminal illness, or to live in a dysfunctional family? Was he truly human; one of us? Did he find some things easy, some hard, some pleasures intense and some less intense, was he pulled this way, pulled that way? Did he have to painstakingly grow and develop, bit by bit, as we do? Or was his personality, his character, his ability to cope and endure, his patience his understanding and compassion so perfect from the moment he was born because he was God. It follows then that if he was so perfect then how can he understand what it’s like not to be so perfect? The question that is almost as old as Christianity itself is this – Was Jesus really human or was he God in human disguise? The answer we give is crucial. Among the things Christians believe is that through the life and death of Christ, God became a part of what it means to be human. He didn’t stand aloof from our pain and trouble. He came right into the middle of all that causes suffering, sadness, depression, sin, rebellion and death. That’s what the approaching Christmas season is all about – God leaving heaven and enduring all that is involved in becoming a human on this planet including birth and the dangers that this involved especially in those times. We say that through Jesus God knows what it is like to be hungry or to have plenty, to toil and sweat. God knows the frustration of learning discipline and skills which do not come naturally. God comprehends what it is like to sleep peacefully or toss sleeplessly, to relax and enjoy a joke. Through Jesus, God personally knows the sneakiness of some temptations and the full on audacity of others. God has experienced sore muscles, head aches, and teenage acne. From Christ God appreciates what it’s like to be warmed by a smile or snubbed by indifference. God understands what it’s like to enjoy a new friendship and treasure an old one, to feel affirmed and to feel betrayed, to suffer for the truth, to be misunderstood, to make enemies, to suffer emotional and physical agony, and to feel forsaken. Yes, forsaken; forsaken by everyone. At the cross God knows what its like to feel forsaken, even by God. For these Christian claims to be true, Jesus would have had to be genuinely one of us. Some people would tell us that if Jesus were not divine, then Christianity is a hoax. That is a part of the truth. I would rather start on the other side: If Jesus were not fully human, then Christianity is a hoax. The letter to the Hebrews, not an easy book to understand, presents Jesus as the truly obedient Son. He prayed and begged God to save him but still he had to suffer. Obedience led to suffering and even though he feared death as much as anyone else, he trusted God perfectly. Through his obedience he gained forgiveness for all those who buckle under the weight of suffering and depression; for all those who doubt God's love for them when life becomes more than can be endured. Jesus learnt what obedience really means through what he suffered. We are told in Luke’s Gospel that Jesus had to grow in understanding and wisdom in the hard school of life. He needed to be taught everything by his parents and teachers and when necessary to be rebuked. He learnt about obedience and suffering. He learnt in much the same way as we do. He experienced life in much the same way as we do. 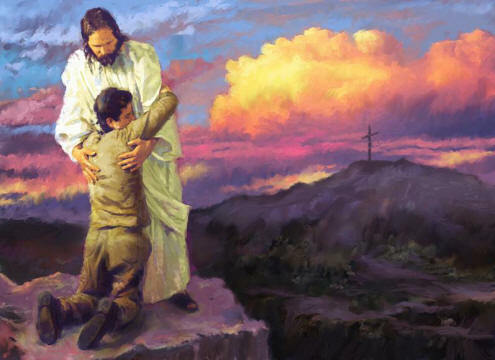 He suffered all kinds of pain – verbal and physical abuse, rejection by both those who were close to him and those who were in positions of authority, hurt feelings, disappointment, sadness, frustration, anger, confusion and the fear of dying. We shy away from that suffering stuff. Not surprisingly, we dislike hard discipline and pain. We would like a trouble free, painless existence. Yet we need to face the unpalatable truth that we often learn more through suffering than we do through comfortable times. On ABC TV, there was a story of two disabled young men. Both became paraplegics and in spite of the immense pain and effort they excelled in sport for those with disability. One of them said: "If it had not been for my accident I would never have achieved as much as I have now. What is more, I am a much different and better person because of my suffering." Suffering, used creatively, can enhance the beauty of a human life. Hebrews sees Jesus finally attainting his perfection in love through his suffering. It’s simple and as awful as that. God in Christ became involved in human experience. God knows the things we go through, and how hard it is to love one another in a largely selfish world. Christ went through the full range of human experience. However some of you may be silently objecting: "Not quite. Okay, he was like us in most ways, apart from one important thing. He did not know what it’s like to feel the shame of sin." If he was without sin, how can he know what it’s like to be us. It’s true, Jesus was without sin, but in his trials and abuse and death, Jesus was presumed guilty. Recall that phrase: "he was numbered among the transgressors." He was in the police line up and they all said: "that’s him!" Imagine what it was like for Jesus to be arrested like a common criminal and dragged off into the night. Think what it meant for Jesus who loved God totally, to be accused and condemned for blasphemy against God, by the highest religious authority in the land. Imagine what it was like to be treated like scum by the soldiers. Think of how he must have felt when Pilate gave the crowd the choice between releasing Jesus or setting free a murderer named Barabbas, and they chose the killer. Guilt was thrust on Jesus from every direction and he had to bear it: He was wounded for our transgressions; he was bruised for our iniquities. In every way, Jesus is one of us. He knows in a very real way what kinds of things are happening in our lives. He assures us of his help in our times of need. He knows how to answer our prayers. He understands our needs. He is ready to give us the strength, help and comfort that we need. The God we praise is the one who is our shelter and strength, always ready to help in times of trouble. We have nothing to fear (Psalm 46:1).